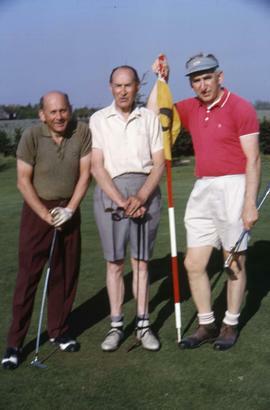 Colour Kodachrome 35mm slide depicts three unknown men, two of whom are posing for the camera and sitting on a golf cart and the third man is standing behind the cart not focused on the camera. Film depicts men and women golfing. 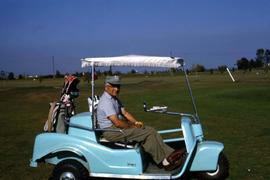 Colour Kodachrome 35mm slide depicts a golf course with a white building and the ocean in the background.